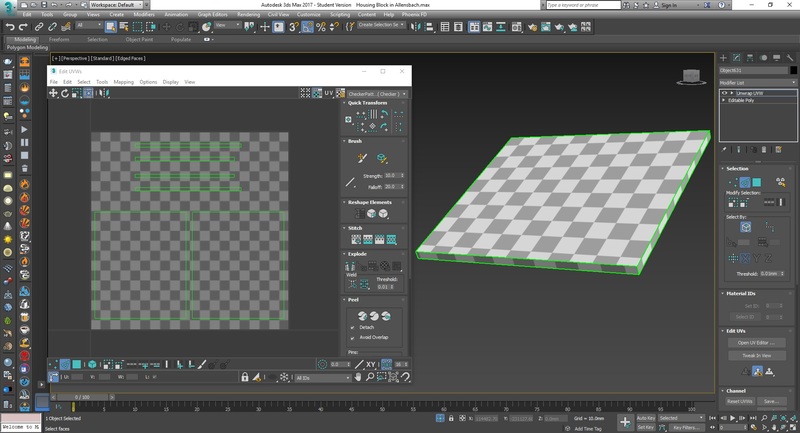 As you can see from the ‘UV unwrap’ image, I have an object which represents a roof tile and I have applied a UV unwrap modifier to it and within the UV editor, I selected the flatten mapping option and then ‘packed’ the shells within the UV map. I then transferred this in to Photoshop to customize a texture and the result is shown in the ‘Tile1_diff’ image. (initially this had no background colour). When this texture was brought back in to the object, I noticed a white band around all of the seams of the object. As this is my first attempt with UV’s I did a bit of research to begin understanding about bleeding seams, downsampling, edge padding etc. I am not to sure if I responded well to my findings but I began to separate the shells to have some breathing space and then chose an appropriate colour for the background to make the transition of the downsampling slightly smoother with the result being the ‘Tile1_diff’ image. If you look at the ‘UV bleeding’ image you will see that the bleeding band still exists, just in a different colour (now clayey-brown instead of white). This is less noticeable than pure white but obviously I want this problem correcting. Can someone shed some light on this and explain where I am going wrong? 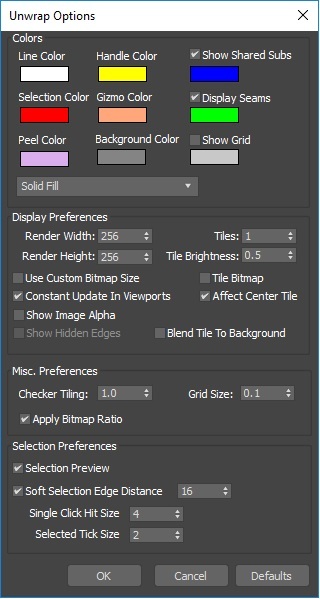 I have also attached photos of the Render UV settings and also the Unwrap option. Maybe you can see something I can’t. Adding a similar color was a good idea, but you’ll have to copy the exact colors of the edge pixels (padding or dilation). In Photoshop you can do this e. g. with the xNormal tools. Separating your mesh into single faces/shells should not be necessary (unless you are using normal maps, then it can make sense in certain cases). If the resolution is high enough, the bleeding around connected edges should be neglegtable (check your viewport texture resolution and make a test render) and the color usually doesn’t have to change perfectly right at the edge anyway). If you want exact transitions with lower resolutions, you can try turning off filtering in the bitmap parameters for the texture (for renderings). What you see is exactly what you bring from Photoshop and that is - you didn’t paint rendered UV layout to fully fill borders/seems or even better over it . Solution is to just scale-down shells in UV editor - same result as editing text. in Photoshop, just simpler and faster. Thank you for the reply Noren. So regarding flattening the shells out, what would you advise to do? 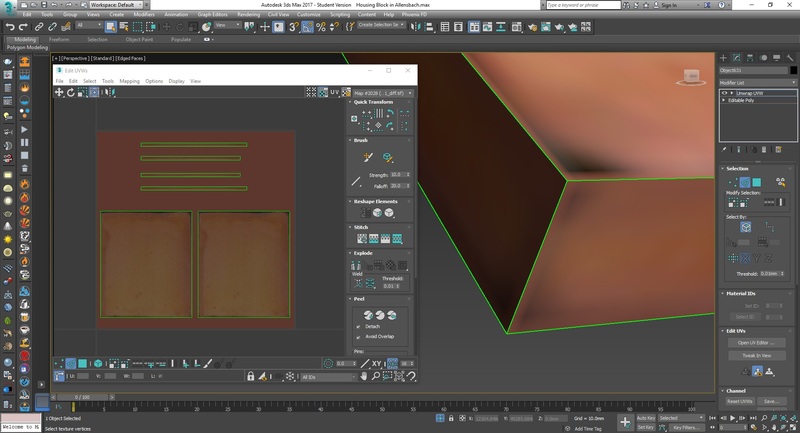 Flatten mapping or peeling etc? I haven’t really explored other alternatives quite yet. Thanks for the tip also about the filtering in the bitmap parameters. I must also add that in the beginning when the white band was present, I did do some test renders and I noticed that the textures were precisely in place with no white showing but I was still confused about the viewport showing this and I thought I had done something wrong. Thanks for the reply Domos. I did scale down the shells in the UV editor to remove the white band but I wasn’t sure if this was a professional way of trying to solve the problem. So is that how people do it? just scale them down and don’t worry about it? That’s why this is done automatically with programs like the aforementioned xNormal (or even 3ds Max’s own RTT [padding] if the uv’s are solidly colored in [to account for filtering/downsampling/mip mapping]). You will need that only for quite small textures, though, or if you are going for a pixelated style.